Analyst Steven Milunovich issued a note to investors on Wednesday, reiterating UBS's "buy" rating on shares of AAPL with a $127 price target. He expects the current flagship iPhone 7 series will spur 8 percent unit growth in fiscal year 2017— a number he said is close to current Wall Street consensus. Looking forward to fiscal 2018, Milunovich has predicted that sales of a so-called "iPhone 8" will cause a spike in sales, amounting to 16 percent year over year growth. Looking back over the last six years of Apple's financials, Milunovich found that the company's stock tends to correlate better with the next 12 months of Apple's results than with six months. "So all investors have to do is correctly predict Apple's next 12-month results relative to expectations— a tall order indeed," he joked. 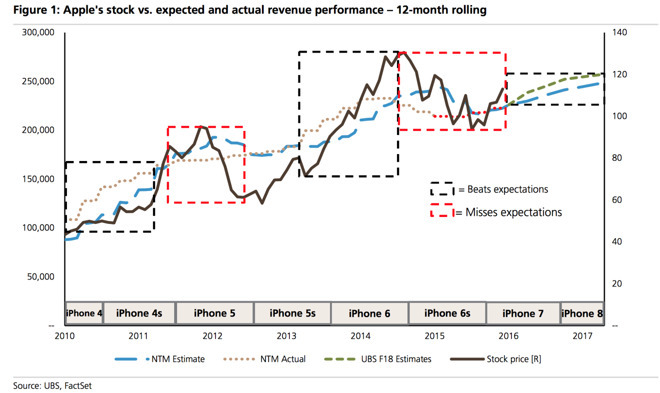 Given historical trends, Milunovich believes investors will begin to discount the anticipated "iPhone 8" cycle in early 2017. His estimates predict that the iPhone 7 will see revenue grow by 4 percent over the next year, with earnings per share in fiscal 2017 reaching $9.30. Even if user upgrade cycles lengthen, he believes the size of the installed base and maturation of the iPhone 6 series will be enough to drive mid-single-digit growth in iPhone units. "Given current retention rates, we expect a larger cycle in (fiscal year 2018) as a differentiated model flushes out pent-up demand," he said. While the newly released iPhone 7 and iPhone 7 Plus have largely the same design as their predecessors, Apple is expected to unveil a completely revamped look for the iPhone in the fall of 2017. 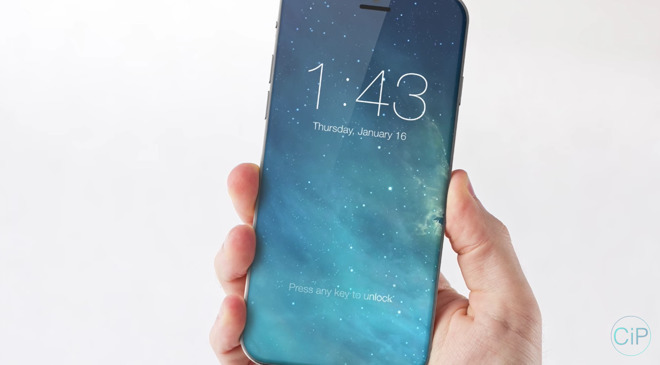 The 10th-anniversary handset is believed to feature both a glass front and back, akin to the iPhone 4 and iPhone 4s series, while the front will feature an edge-to-edge display that could hide components such as the Touch ID fingerprint sensor, earpiece and FaceTime camera underneath a new OLED screen.